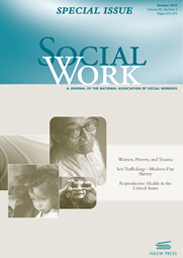 Social Work is the premier journal of the social work profession. Widely read by practitioners, faculty, and students, it is the official journal of NASW and is provided to all members as a membership benefit. Social Work is dedicated to improving practice and advancing knowledge in social work and social welfare. Its articles yield new insights into established practices, evaluate new techniques and research, examine current social problems, and bring serious critical analysis to bear on problems in the profession. Major emphasis is placed on social policy and the solutions to serious human problems. Feminism and Islam are rarely considered to be complimentary to each other or even capable of coexisting. A mere cursory glance of any major media outlet and one can find endless articles, newscasts, and videos of radical Islam waging war against the West and systematically oppressing women. The image of the veiled Muslim woman has become emblematic of the patriarchal control Islam seems to yield unrelentingly over female followers of the faith. Yet many Muslim women who wear the veil, or practice hijab as it is correctly termed, are speaking out not only in defense of this garment but are also outright rejecting the notion that all women who wear hijab do so out of coercion. There is very little literature in the social sciences that examines Muslim women who practice hijab from a place of empowerment, receptive to the idea that the hijab can be a feminist act. A study I conducted, which has recently been published in Social Work, set out to explore how Muslim women living in America who willingly chose to practice hijab responded to questions about feminist identity, female empowerment, and body image. Do Muslim women who choose hijab embrace values at odds with feminism or have we as a society merely bought into a limited image of what feminists look like? The answer was unanimous amongst participants; such women may indeed challenge the image of feminism but are not in contradiction of its core philosophy of gender equality and personal autonomy. Moreover, many women voiced the opinion that the hijab was not only a refusal to be defined by their physical bodies, but that it also demands others focus on the quality of their intellect and personality. There is no doubt that radical Islam and authoritarian regimes have exploited the practice of hijab to exert patriarchal control. Many Americans were horrified by the conditions Afghan women endured under the Taliban and rightfully so. After 9/11, politicians and feminist groups alike repeatedly cited the image of the burqa-clad woman as evidence of the need to send troops to the Middle East. This was not a new strategy. Western women’s rights groups were also employed during colonialism in North Africa to rescue Muslim women from Muslim men and from Muslim veils. Never mind the fact that local Afghan women, such as the Revolutionary Association of the Women of Afghanistan (RAWA), have been boldly fighting fundamentalism since the late 1970s. The message became clear: if the hijab was present then women’s voices were absent. Has Western feminism been too limited both in understanding the motivations behind why Muslim women wear hijab, as well as in constructing the image of a feminist? The women in the study would certainly argue that it has. None of these women fit into the image of the downtrodden and disenfranchised Muslim woman in need of rescue. All were well educated and most were pursuing post-graduate degrees including PhDs in engineering, medical professionals, and teachers. One woman owned and operated her own successful business completely independently. Some were married, some divorced, others single and focused on furthering their education and professional careers. In both native born and immigrant groups, several were the only women in their families to wear hijab and some did not begin the practice until their late twenties, forties, or even fifties. Politicians are not the only ones to use the image of Western feminism to their advantage. Capitalist ventures have modified marketing campaigns to appeal to women as female empowerment became more mainstream. Ads that glorified the domestic housewife of the 1950s have since been replaced by shampoo, fashion, and feminine hygiene commercials using the rhetoric of choice, freedom, and liberation to sell their products. Women’s bodies are constantly on display and more often than not portrayed by impossible standards of beauty. A number of women in this study found such images to be against feminism and argued that through limiting the exposure of their bodies in the public sphere it reduced, if not altogether removed, the pressure to be defined by the beauty industry. So what does this have to do with social work specifically? Muslims constitute one of the largest minority groups in America and their numbers are only expected to grow with the rapid expansion of Islam as a religion, as well as the growing refugee crisis from the Middle East. They are also repeatedly the victims of hate crimes and the Council on American-Islamic Relations (CAIR) has found that Muslim women who wear hijab are more often the targets than their male counterparts. Muslim student groups have been wiretapped on college campuses, Muslim men and women have been violently attacked and even murdered in public, mosques are repeatedly vandalized, some countries have criminalized the hijab, and there is growing sentiment that Islam is simply incompatible with the West. Studies have even found prejudicial behavior in mental health services, citing examples of clinicians who demanded women remove their hijab during therapy sessions or focusing on the goal of removing the hijab instead of the intended reason the client sought services. Social work by its very definition seeks to bring attention to prejudicial belief and practices that lead to both poor public policy, as well as poor mental health. It is incumbent upon all social workers to engage in culturally competent education and advocacy work that embraces diversity rather than establishes fear and distrust in the other. Muslim women, regardless of if they wear hijab or not, must not be assumed victims of oppression but rather valuable assets to learn from and work alongside with, in our quest for gender equality and a more inclusive America. Image Credit: Photo by Wahyucurug. Public Domain via Pixabay. Anderson Al Wazni, MSW, is a 2014 graduate of Smith College where she completed her thesis on Muslim women and hijab. She is currently continuing her studies through a part time Islamic seminary program and aims to increase visibility of Muslim women in public discourse through writing and public speaking. She currently resides in North Carolina where she provides free English courses to local refugee women. Anderson is the author of "Muslim Women in America and Hijab: A Study of Empowerment, Feminist Identity, and Body Image." The hijab can be a feminist act. I would like to invite you to look at “Between Allah and Me (and Everyone Else) the film about diversity, complexity and unexpected feminism around the meanings of hijab.